Based in Ghana, Kaisa works on research, advocacy and technical assistance across NRGI’s Africa programs. In supporting the implementation of NRGI’s programs in Guinea and Democratic Republic of Congo, she focuses on benchmarking resource governance with the Resource Governance Index and promoting transparency and accountability of state-owned enterprises and other key institutions. As part of NRGI’s governance programs, she also works on contracting and subcontracting practices in the extractive industry. Prior to joining NRGI, Kaisa worked as a management consultant at Ernst & Young in Finland and South Africa, with a focus on strategy and supply chain management in the energy and natural resources sectors. 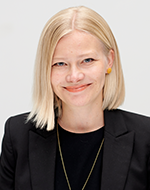 Previously she worked for the Finnish government in Kenya on trade, investment and economic policy. Kaisa holds master’s degrees in global politics from the London School of Economics and Political Science and in management from the Helsinki School of Economics, and an undergraduate degree in international relations from the University of Helsinki. 15 hours 38 min ago. 17 hours 36 min ago.